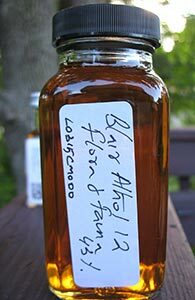 In 2014/2015 there were quite a few Blair Athol 1988s on the market, all in the mid-20s age-wise. Many of these were bottled by Signatory—21 of the 47 Blair Athols listed on Whiskybase are from Signatory*; and another 8 are from van Wees, who source from Signatory, I believe. I’ve reviewed some of these: I really liked this 26 yo bottled for K&L; I also liked this 26 yo and this 25 yo, both from van Wees. Most recently, I thought this 25 yo bottled for LMDW was excellent as well (I could be wrong but I think Signatory was the source of this cask as well—if you know differently, please write in below). All of these casks have proximate numbers, by the way, suggesting perhaps that a big parcel of casks was purchased all together by a broker. Here is the third, and penultimate, in my mini-run of reviews of recent Signatory exclusives for K&L. Will this hold any surprises as Monday’s Benrinnes did? I expect not as this is not my first sherried Blair Athol of this general age from this period. I’ve previously reviewed a 25 yo and a 26 yo, both from 1988, both from sherry casks and both bottled by van Wees. My understanding is that Signatory is also the source of van Wees’ casks; if that’s true then that bodes well for this one: I liked both the aforementioned (though one more than the other) despite their being at 46%; this one is at cask strength. Let’s make it three sherried whiskies in a row this week. My friends Clara and Rob sometimes join in on my European whisky purchases. Sometimes they want specific things (usually the Glenfarclas 15), sometimes they ask me to recommend things they might like and which seem like good values. 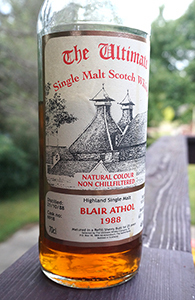 As I know they like sherried whiskies, and as I really liked the last Blair Athol of similar age from van Wees that I reviewed (this 25 yo, also from 1988), I recommended they take a chance on this one. Van Wees’ selections are always good value. I was happy to hear that they are really enjoying it, and also happy that they shared a couple of ounces with me. Despite the colour (at a diluted 46%) this one is from a refill sherry cask—European oak maybe? This was bottled late last year. Another in Diageo’s “Flora & Fauna” series. Blair Athol is a distillery in the Highlands; it is not terribly well-known and it doesn’t put out much by way of official single malt (this expression may be it). Most of its output goes into the Bell’s blend. There’s not very much of its malt available from independents either. I’ve had a somewhat blank 12 yo, 1998 in Signatory’s UCF series and that did not inspire me to hunt down more–there are a couple from Signatory and Douglas Laing on the US market, and lately there seems to be an older one from Duncan Taylor as well (any feedback on these would be greatly appreciated). This official sherried bottling I purchased with some confidence as it has a decent reputation, and as I quite enjoyed the similarly sherried entries in the series from Mortlach and Dailuaine.